The 5D3 5-Bay Thunderbolt 3 Enclosure (Gold Edition) from Drobo improves upon the original 5D3 by pairing it with a 128GB mSATA SSD and five years of DroboCare warranty services. The 128GB mSATA SSD is installed into the unit's Accelerator Bay and boosts system performance by placing data that is read or written into SSD storage. When the data is active, it is stored in the SSD and will be moved back to the hard drive tier as its use decreases. Upon product registration, the extended five-year DroboCare warranty provides hardware replacement, technical support, and migration assistance. Additional data protection is provided by the included rechargeable battery, which helps protect data stored in the 5D3's cache. If there were to be a sudden power loss, the battery allows the Drobo to stay powered long enough for the cached data to be written to non-volatile storage. Cooling is provided by a 120mm variable-speed fan and once installed, the hard drives can be configured to spin down when they're not in use, helping to further reduce noise and energy. Also, the LEDs can be dimmed to reduce light pollution when working in sensitive environments. The Drobo 5D3 also includes a 3.3' Thunderbolt 3 cable and a 6.0' power cord with a power supply that operates using 100-240 VAC at 50-60 Hz. 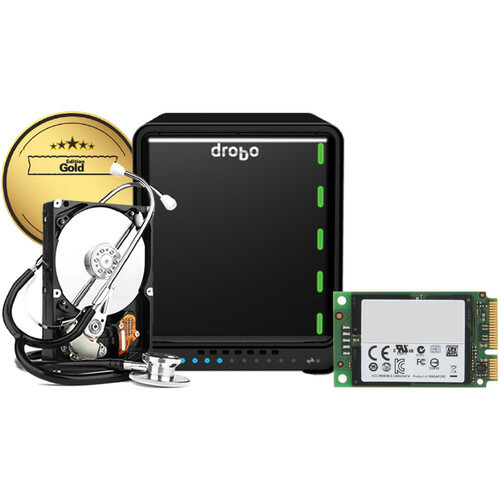 The Drobo 5D3 includes a built-in Accelerator Bay, with an 128GB mSATA SSD. Their patented Accelerator Cache technology keeps a copy of your most frequently accessed data to deliver fast speeds. The accelerator cache can dramatically speed up loading large photo libraries and other I/O intensive operations, smoothing out workflows allowing you to optimize productivity for applications such as Apple Final Cut Pro X and Adobe Lightroom. Will this item support access to same data from both Windows 10 pro and Mac OS at different times? The Drobo 5D3 5-Bay Thunderbolt 3 Enclosure (Gold Edition) B&amp;H # DRDR6A21G can only be accessed by one computer at a time. If you are looking for a device with those capabilities, I suggest looking at the QNAP TS-453BT3 4-Bay NAS Enclosure B&amp;H # QNTS453BT38G. It supports both NAS and DAS functionality. What size screws do I need to mount this drive into a Drobo 5D3?